Quran Translated into Latin – Muslim Museum UK – Uncover the 1400 year relationship between Britain and Islam. Explore the history and heritage of Muslims in Britain. Robert of Ketton (also known as, Robertus Ketenensis) (c1110–c1160), an English theologian, astronomer and Arabist, was the main contributor to the first translation of the Qur’an into a European Western language, Latin. In 1134, he travelled from France to the ‘East’ for four years with his fellow student and friend Herman of Carinthia (Herman Dalmatin). 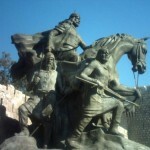 They visited the Byzantine Empire, the Crusader States in Palestine, and Damascus. By 1141, Robert had moved to Spain where the division of the country between Muslim and Christian rulers made it a natural base for translators. Robert translated mostly scientific work rather than theological works. He is known to have translated the work of Al Battani and Avicenna. 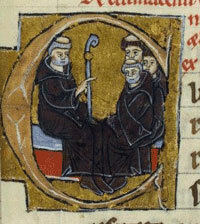 In Spain he was visited by Peter the Venerable, an abbot of the Benedictine abbey of Cluny, France. Peter brought together a team of translators and commissioned them to translate a number of texts relating to Islam. The most important being the first-ever translation into Latin of the Qur’an, the ‘Lex Mahumet Pseudoprophete’ or ‘The Law of Mahomet the False Prophet’, completed 1143. 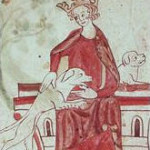 Robert of Ketton was the main translator. Peter of Toledo is credited for planning and annotating, and Peter of Poitiers (Peter the Venerable’s secretary) helped to ‘polish’ the final Latin version. The team also included Robert of Ketton’s friend Herman of Carinthia and a Muslim called Mohammed. Collectively, they were part of what is known as the Toledo School of Translators (Spanish: Escuela de Traductores de Toledo), which translated many Arabic text. The translation was created in hopes of aiding the religious conversion of Muslims to Christianity, thus was flawed and biased. In spite of its inaccuracies, Ketton’s translation was popular in its time, with over 25 manuscripts still existing, It was the standard translation for Europeans from its release until the 18th century. It appeared in print for the first time in 1542/43. It became the primary basis for further translations into Italian, German and Dutch. 1480-1481 saw the first bilingual translation into Latin with accompanying Arabic by Flavius Mithridates. In 1647, Andrew Du Ryer produced the first French translation. This was translated directly from Arabic and a marked improvement from earlier versions.